It’s cozy sock weather time. If you don’t know, we Minnesotans are serious about our cozy socks and slippers. I get home from work and it’s time for my cozy socks. It’s the Mr. Rogers wardrobe change, off go the big clunky snow boots or dress shoes and on go the comfortable slippers or socks. 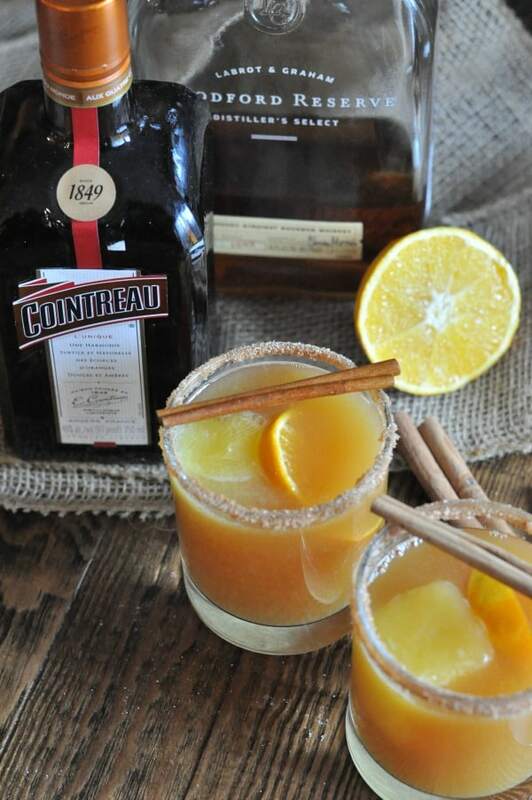 This Hot Bourbon Cider Cocktail is the cozy drink you need to go with those cozy slippers. The drink is super simple, so it can even be a weeknight sipper. 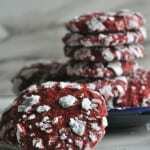 Simple ingredients and perfect for a cozy night at home or as a holiday cocktail. 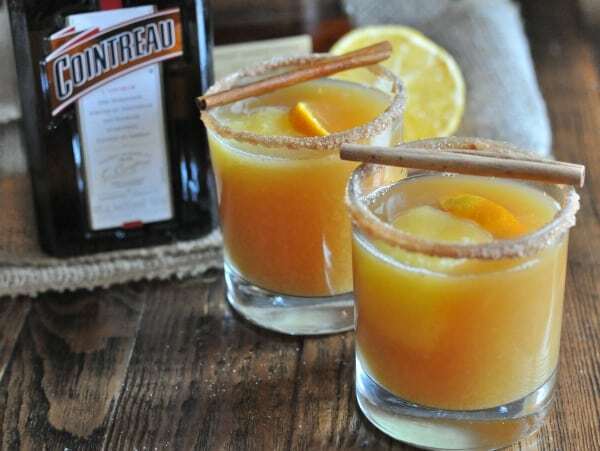 For this Hot Bourbon Cider Cocktail, I start with a cinnamon sugar rim. You just need a small dish with some water and another dish with your cinnamon sugar mix. 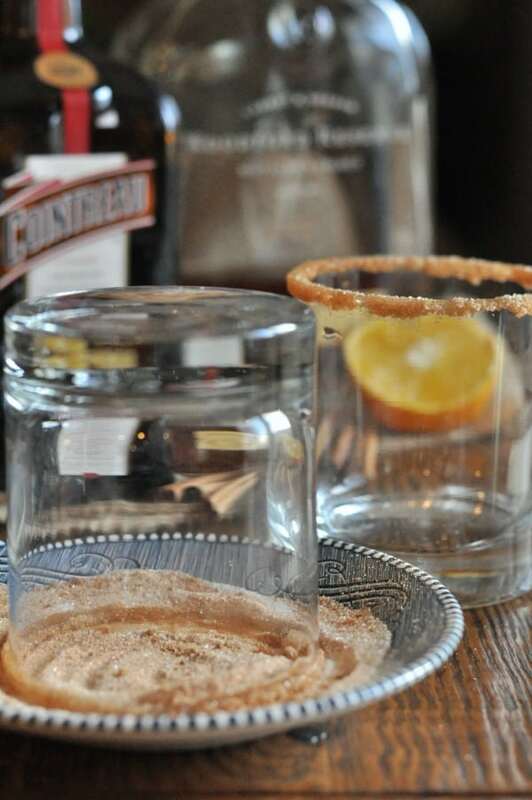 Dip your glass in water and then into the cinnamon sugar mix. My husband loves sipping Bourbon at night and a couple years ago, I bought him some special ice cube trays. The cubes are really large and you can also use them to make flavored cubes. For this recipe, I made large orange juice cubes. You can buy these large ice cube trays here at this link (affiliate). I like the juice ice cubes because it gradually cools down the hot apple cider and slowly brings the juice into the cocktail. For the Hot Bourbon Cider Cocktails, I put the big orange cubes in the glass and then pour in hot apple cider, bourbon, and Cointreau. Wait, what’s Cointreau you say? Well, it’s a super tasty orange liqueur. It compliments the bourbon and apple cider in this cocktail and you can use it to make the best margaritas and is really good mixed with lime juice and soda water. 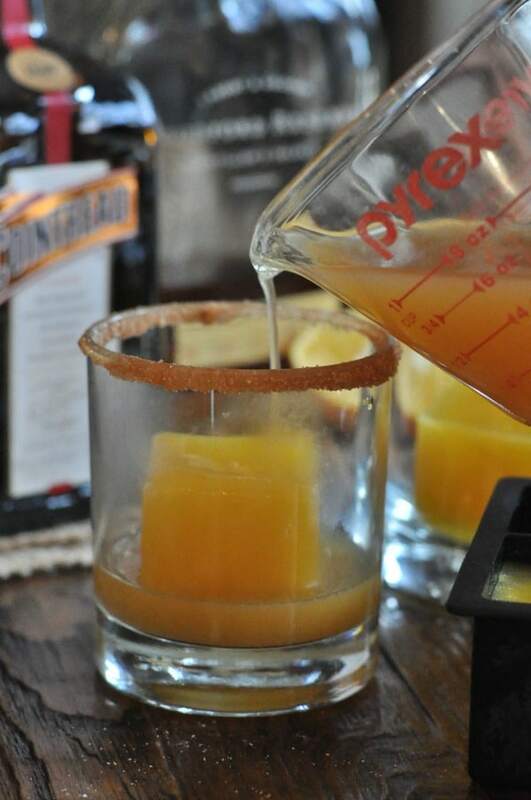 I garnish my Hot Bourbon Cider Cocktails with a small slice of orange and a cinnamon stick. 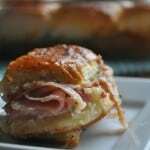 If you love Bourbon, check out my other Bourbon recipes below. 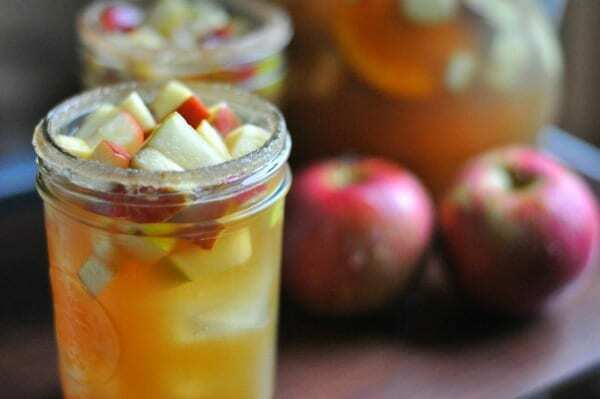 For a crowd, try my Bourbon Apple Cider Sangria a white wine and apple cider punch with bourbon-soaked fruit. 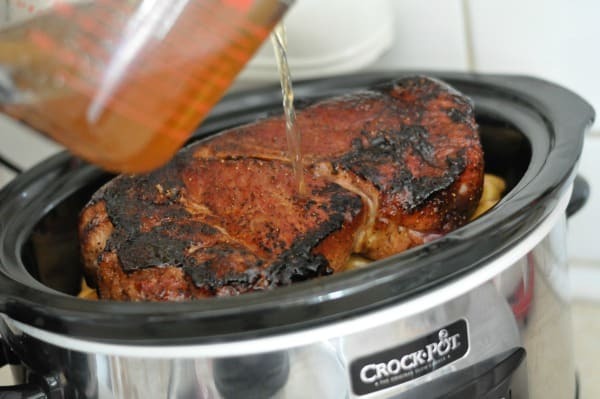 Bourbon isn’t just for your cocktail, try it in your Crock-Pot Slow Cooker and make my Maple Bourbon Pot Roast. 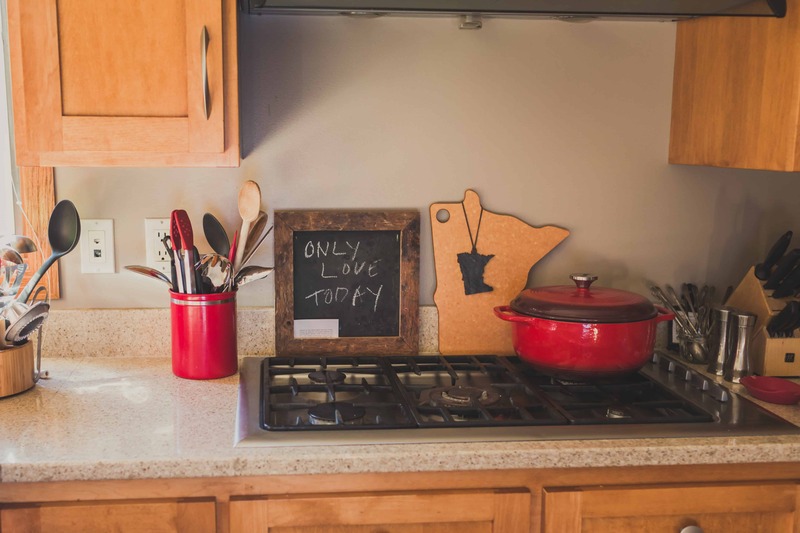 I’m excited to share that I’m a Top Shelf Blogger with Drizly. Drizly is a liquor delivery service bringing your favorite wine, beer and spirits to you in under and hour. Yes, a delivery service for alcohol! 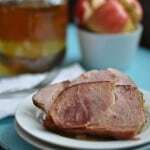 There are so many reasons you may need a delivery–you hate leaving your house in the snow, you are prepping for a party and you forgot a key ingredient for a cocktail or maybe you just want to stay cozy on your couch and you need your favorite craft beer. As a Top Shelf Blogger with Drizly, I’ll be creating some fun and easy cocktails and sharing tips and recipes from their web page with you. 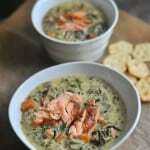 Get your Cointreau and Bourbon for this recipe on Drizly and have it delivered right to you! 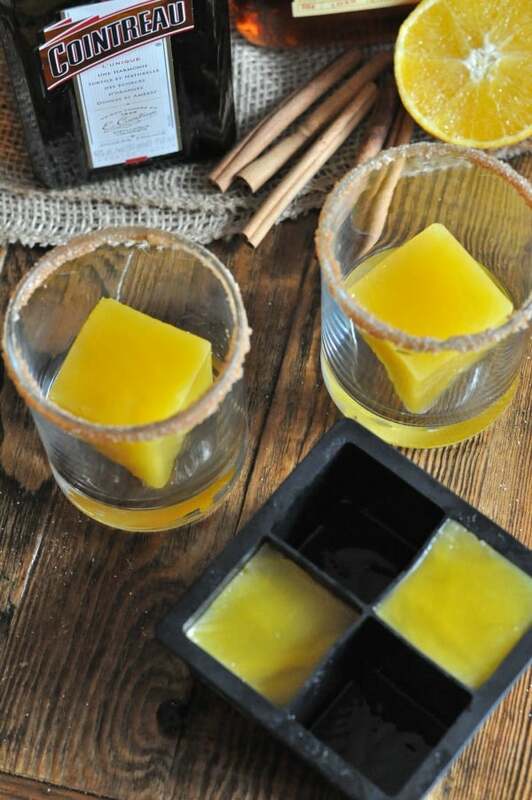 Prepare ice cube trays with orange juice the night before you make your cocktails. Place 2 TB water in a shallow dish. Set aside. 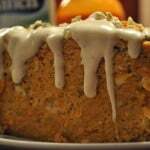 Place 2 TB Granulated Sugar and Cinnamon in a shallow dish and mix to combine. Dip each cocktail glass top into the shallow dish with water then the dish with cinnamon sugar mix. Place orange juice cubes into the glasses. Pour the hot apple cider into the glasses. 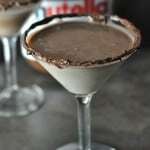 Add 1 ounce Cointreau and 1 ounce of Bourbon to each glass. This post is sponsored, all opinions are my own. Thanks for your support and giving me the opportunity to share my favorite companies and products with you! 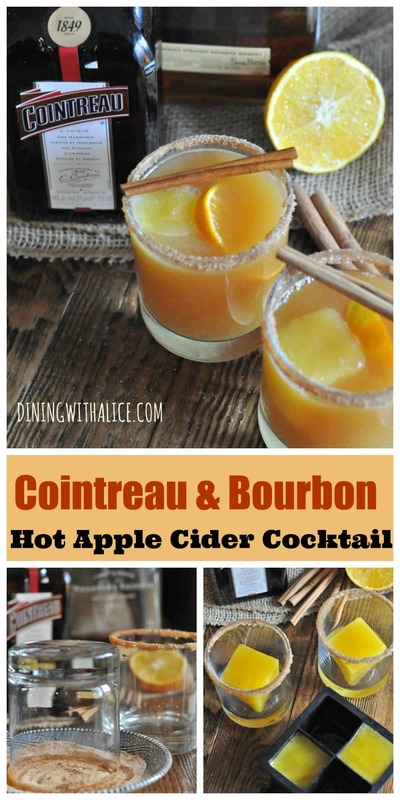 This entry was posted in Drinks and tagged apple cider, bourbon, christmas, cider, cocktail, cointreau, Holidays, hot, Orange, recipe, Sponsored, Thanksgiving, warm by Alice Seuffert. Bookmark the permalink.